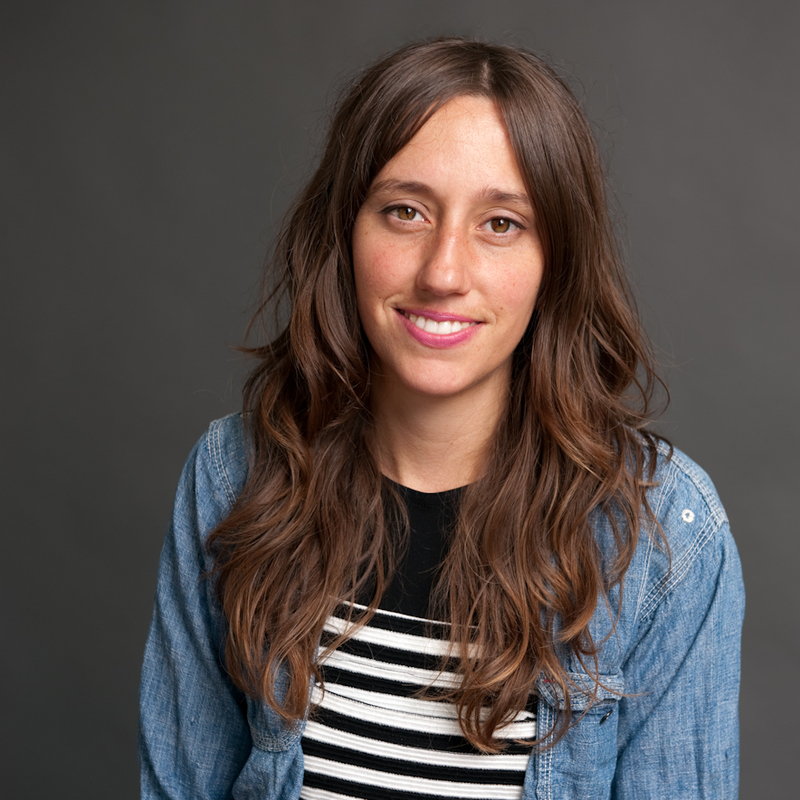 Today's post features an interview and portrait of Oakland based artist and illustrator, Maria Schoettler. 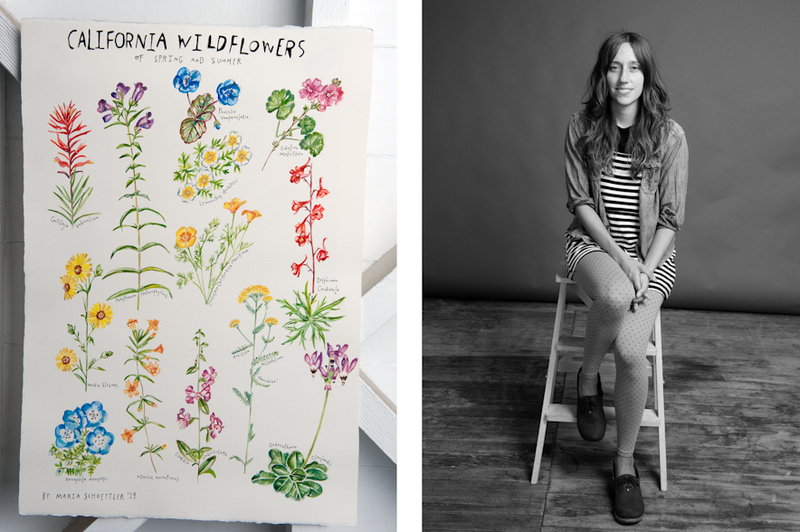 I thought that featuring Maria would make a perfect fit for the blog because much of her stunning artwork is inspired by the natural world. I was thrilled when she agreed to stop by the studio last weekend. 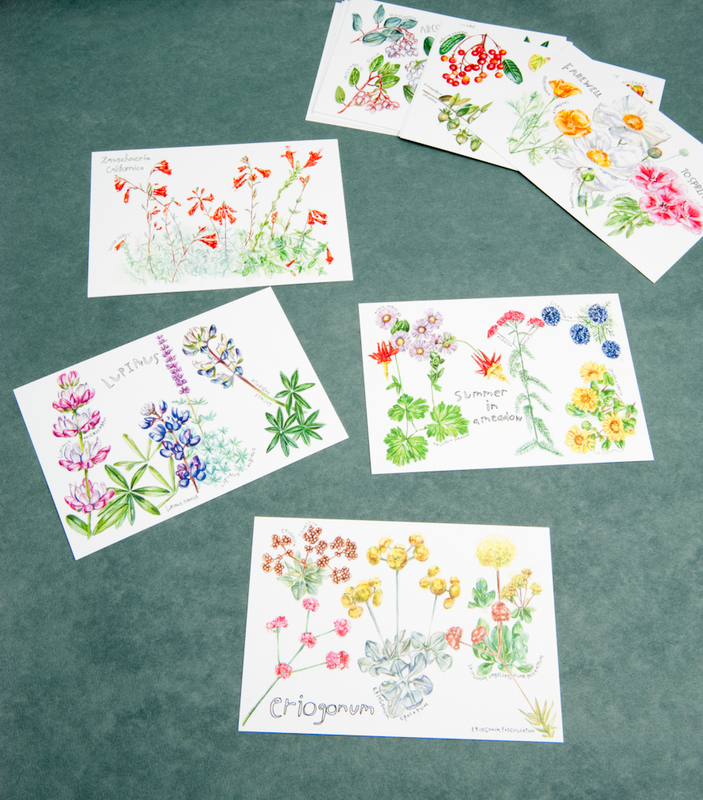 She brought a few examples of her work with her —including a gorgeous painting of California wildflowers and a set of botanical postcards. The postcards are so exquisitely printed that I had to ask her if they were the originals. She replied she had worked extremely hard to achieve that level of quality in her prints. And it certainly shows! Where did you grow up? What brought you to Oakland? I grew up in Fresno, CA. I attended UC Santa Cruz for undergrad and moved to Oakland because I always wanted to live in the Bay Area. It was sort of a natural progression from Santa Cruz, a bigger urban area with more options in terms of jobs and opportunities. Also it's a hub of good food and that's definitely something I am interested in. When did you decide you wanted to pursue art as a career? I always knew I wanted to be an artist but wasn't sure I would be able to make it a "career." After transferring my large oil painting practice to a smaller framework of working on paper with gouache, I realized I could do art outside of the academic setting- one that required a lot of space, ventilation and live models. I made my first seasonal food calendar just for fun out of a genuine excitement about the topic and then it started catching on with friends and family. From there I realized it was something that I could potentially sell. This launched a whole bunch of other little projects and has grown in to opportunities I wouldn't have anticipated, but am super excited about. I love making art that is more democratic and affordable- an art object that can be incorporated into people's everyday lives. 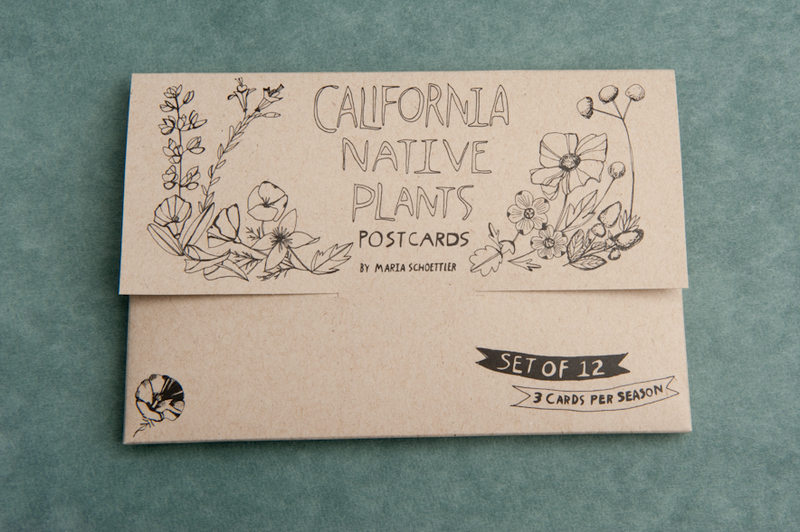 How did you first become interested in CA native plants? 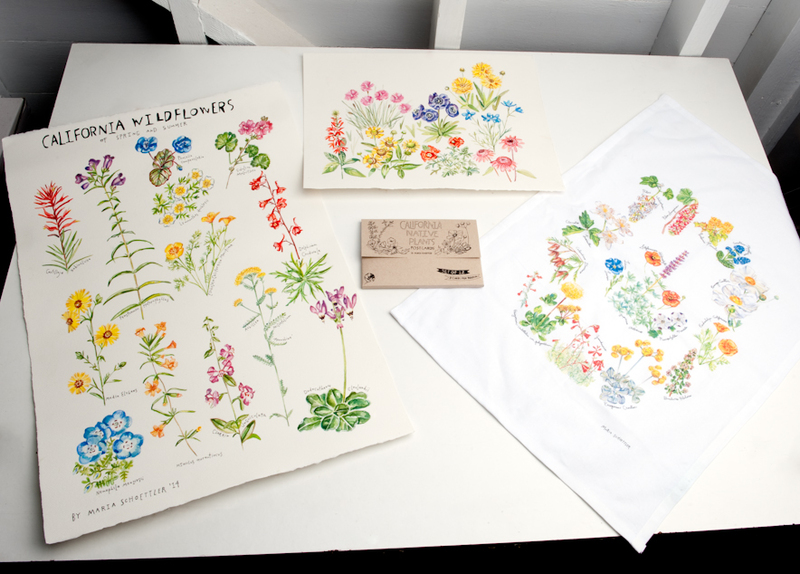 How did the idea for your California Wildflowers Calendar come about? I became interested in CA native plants by another strike of chance. It started with a project commissioned by a family friend for her landscaping business, but then the subject just kind of stuck with me and incorporated itself really nicely into what I'm interested in as far as being "California centric" and wanting to live harmoniously with the land and the seasons. Especially in a time of extreme drought that we are in, when people really need to look at their yards and re-evaluate, I feel ever more strongly that people need to be educated about the beauty and simplicity of growing native plants. They're so special. Will you share a little about your creative process? My creative process involves a little too much time in a dark studio than I'd like to admit. I draw as much inspiration as I can from hikes and walks around my neighborhood (where some of my favorites live) but due to the ephemeral nature of blooms and plants, it's hard to put them through the torture of wilting in my studio. I often work from pictures I find and some of my own when I'm lucky enough to spot a plant celebrity. All the while remembering fields of lupines and poppies on Mount Tam in the spring. Do you have an upcoming project / new work you are excited about? I'm painting lots of flowers right now for a group show I am putting together at the Bolinas Farm Stand in October. They aren't all native but they are beautiful flowers just the same! It's still taking shape, but I will definitely be focusing on plants. They are a great way to explore color relationships. You have your BA in Art Practice, how is that different from Studio Art? Why did you choose that route? Art Practice is not different from Studio Art. I chose Art because I have always chosen art in the big moments! I loved that time in college when all I had to do was make art. It was an incredibly inspired time in my life and in part because it wasn't as solitary as it is now. The energy of a college studio is incomparable, at least it was for me. I was working alongside some very inspiring people and when you find the right people to work with they are every bit as inspiring as beautiful spring flowers.